If you are unsure which system is right for you, or you have questions about your water softening, deionization, reverse osmosis or other ultapure water treatment or piping, we offer engineering site visits to help consult you in designing the perfect ultra pure water system including piping, pumps, tanks, flow rates and water treatment equipment. 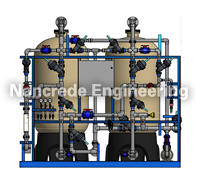 You may decide to completely outsource your ultrapure water needs with a Build, Own, Operate service designed and operated by Nancrede Engineering Company. The following high purity piping guide, developed by Nancrede Engineering Company, is a series of piping recommendations for corresponding high purity and ultra high purity water treatment applications as well as the maximum temperatures that the piping can accommodate. It is also very important that high purity or ultrapure water pipe fitting joints must not utilize chemical (solvent) bonding techniques or threads for assembly. Fitting joints must be accomplished with a heat based process. Suggested water velocity within the pipes for ultrapure water is 3-6 fps (feet per second). The quality of water degrades as it is stored and is highly susceptible to bacterial growth. Recirculation of the water at the above velocities reduces the likelihood of the establishment of colonies and biofilm. Installing a UV system and .2 micron or smaller filter helps prevent bacterial growth. Smaller storage tanks, which don’t allow water to sit statically for long as well as spray balls or spray bars also reduce likelihood of bacterial growth. Lastly, deadlegs should be eliminated or minimized. Due to the reduction or removal of ions, treated water can sometimes become ‘aggressive’ and corrode some kinds of piping. Therefore, when utilizing a water treatment system, it is important to consider the piping that will be used for water’s transport. Nancrede Engineering will work with you to find the right solution, assist in proper design of your industrial, commercial or municipal water system, and ensure proper installation, system start-up, and owner training for your customers.